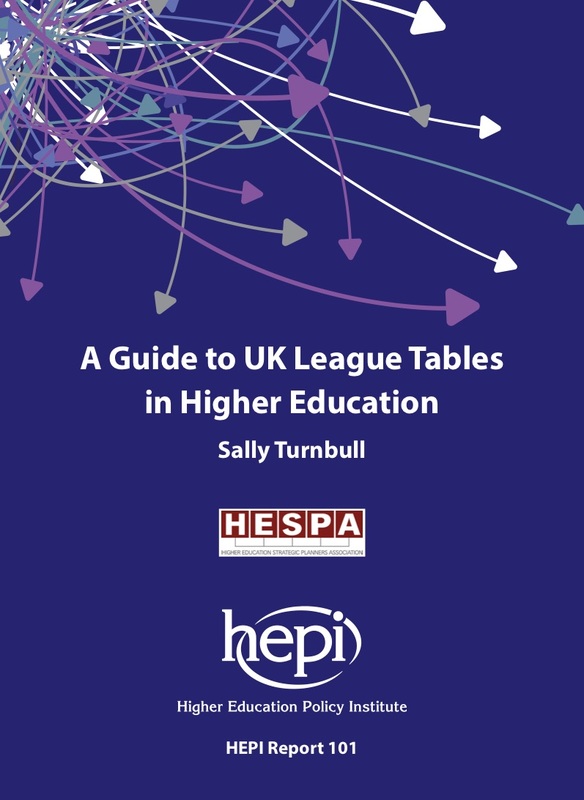 The Higher Education Policy Institute (HEPI) and the Higher Education Strategic Planners Association (HESPA) are jointly publishing A Guide to UK League Tables in Higher Education by Sally Turnbull. The paper looks at what goes in to making up the three main UK university rankings, which are published by The Times and Sunday Times, the Guardian and the Complete University Guide. It considers the similarities and differences between them and urges prospective students, policymakers and higher education providers to use them with caution. Universities are judged by their position in the league tables. Rankings determine reputation, prestige and student numbers. That is why university governing bodies hold their vice-chancellors to account for their league table positions. But users of the league tables tend to know little about how the rankings are put together. In other words, they do not know, precisely, what it is they are holding people to account for. The main league tables are not going to disappear any time soon because they provide comparative information and people find them useful. But they are easily and often misunderstood. My hope is that everyone who holds our universities to account will set themselves a new year’s resolution to look under the bonnet of the league tables before using them. Our new guide is aimed at building a deeper understanding of what the different UK league tables measure and what they ignore. It also points out that many valuable things done by institutions cannot be easily measured or incorporated into the rankings. Having spent more time than is probably healthy examining the details of various university rankings, I find myself continually using the phrase “yes, but…” in conversations about them. Writing this guide has given me the opportunity to put some of these “buts” on paper. I am grateful to both HEPI and HESPA for offering me this challenge. League tables are both interesting and useful. But, as is the case in much of today’s knowledge society, we need to be able to navigate and understand this information effectively, so that it aids – rather than drives – what we do. We are delighted to have had the opportunity to work on this league table guide with HEPI. University rankings bear hugely on the reputations of our member institutions and their ability to recruit and retain the right staff and students. There is no future without rankings, but it is critical their strengths and weaknesses are recognised and understood so they may be used in sensible rather than silly ways. League tables should be just one part of a broad range of assessment tools through which we derive and compare information about different higher education providers. HEPI published a separate paper on the main international university league tables, International university rankings: for good or ill by Bahram Bekhradnia in December 2016. The Higher Education Policy Institute was established in 2002 to shape the higher education policy debate through evidence. We are UK-wide, independent and non-partisan. We are funded by organisations and universities that wish to see a vibrant higher education debate as well as through our own events. For further information, see www.hepi.ac.uk. The Higher Education Strategic Planners Association is the representative body for those working in strategy and planning in UK higher education. For further information see www.hespa.ac.uk.